Assemble entertaining holiday mosaics and enjoy a cornucopia of fun. "I love mosaic games, and this one is no different. I love the look of the pieces; they remind me of stained glass. There are many different puzzles to choose from and it's perfect for playing over the holidays." Pick out a turkey, decorate the house and invite people over for Thanksgiving Day. Give yourself and your loved ones a true holiday experience as you assemble mosaics and discover new things about the holiday of the harvest and gratitude. Entertaining puzzles including traditional parades, the horn of plenty, and fields of ripe corn all await you. 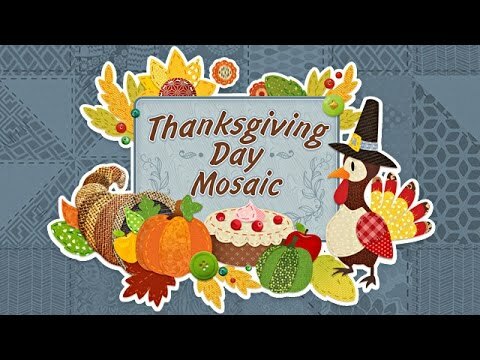 Featuring 120 unique patchwork puzzles, special quests for the real pros, and entertaining gameplay for all ages, Thanksgiving Day Mosaic is a cornucopia of fun. Solve brain teasers in the magical world of Alice depicted in a modern style. Revisit the beloved fairy tale and solve mosaic brain teasers. Twist and turn through this collection of mind-bending puzzles.